The Winter Giveaway is now closed! Congrats to AudreyO, comment #50. Go check out the Bloggy Giveaway Carnival! But while you’re here, I might as well give you a chance to win your very own Sheila-made bracelet. (That’s me!) I have recently opened my Etsy store, A Lemon Berry Slush (go ahead and click over… I’ll wait here), specializing in beaded jewelry women and girls. For my winter giveaway as part of the carnival, I am offering this lovely teal bracelet accented with small pink rose quartz beads: All you have to do is click over to my Etsy world, come back and leave me a comment telling me either 1. which bracelet you love, or 2. what you would love to see in my beaded jewelry store, or 3. your best advice as a fellow seller on Etsy! That’s all, folks! I’ll let my ego get big all week as I watch my counter rise, read all your comments, and then (probably) Friday I’ll let random.org do all the work of choosing a winner! The pink and gray one is quite fetching. OOOHHH, I love hues of blue!!!! I have been eyeing the jewelry making for a while now. You are inspiring me to want to learn how to do it and sell it too! I am not a seller on Etsy, but if I start this up, maybe i’ll do it! Pretty pretty! GASP! I just saw the Great in Green one, I LOVE LOVE LOVE it! I love the green with envy! The green! My favorite color. I really like the Green w/ Envy bracelet.I’d like to suggest making some bracelets that have more than 1 strand. I love the Pretty in Purple! The perfectly purple or the circle, circle, square. I can’t decide! Gorgeous work!Thanks for a great giveaway. I really love the Heart of Pink bracelet!!! And I love your shop, I added you to my favorites. Thanks for the chance to win, you can contact me through my etsy shop, http://www.rhbdesigns.etsy.com.Stop by my blog for a jewelry giveaway too! I’m having a hard time deciding, but I think my favorite is the Wonderful in Wood bracelet. Thanks for the chance to win! All beautiful but I especially like Heart of Pink. Love the Tickled Pink bracelet. Thanks. I like the Heart of Pink bracelet, they are all very pretty though. I love the Blue, Baby, Blue bracelet. I like your great in green bracelet! It looks so retro. I really like Pretty in Purple! I adore the Hues of Blue. But’s so hard to choose, they are all so pretty! 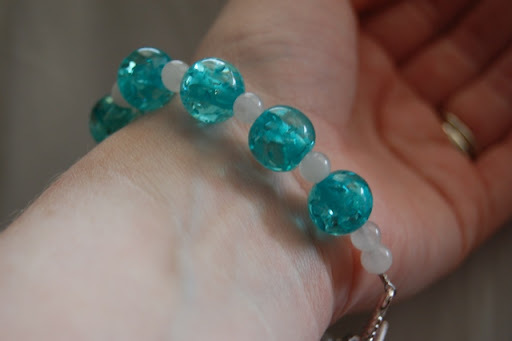 I like the pink and gray bracelet, but this teal one is perfect! I like the circle circle square braclet. Pink and Gray bracelet–very attractive! I love the Green with Envy. Very pretty! I like the circle circle square bracelet. Easy, the perfectly Purple. 🙂 Love it. Have you thought about some sets and adding necklaces? Thanks for the chance to win, and the great giveaway. Love the Great in Green bracelet! i love the Tickled Pink one.i wear a 7″ bracelet.